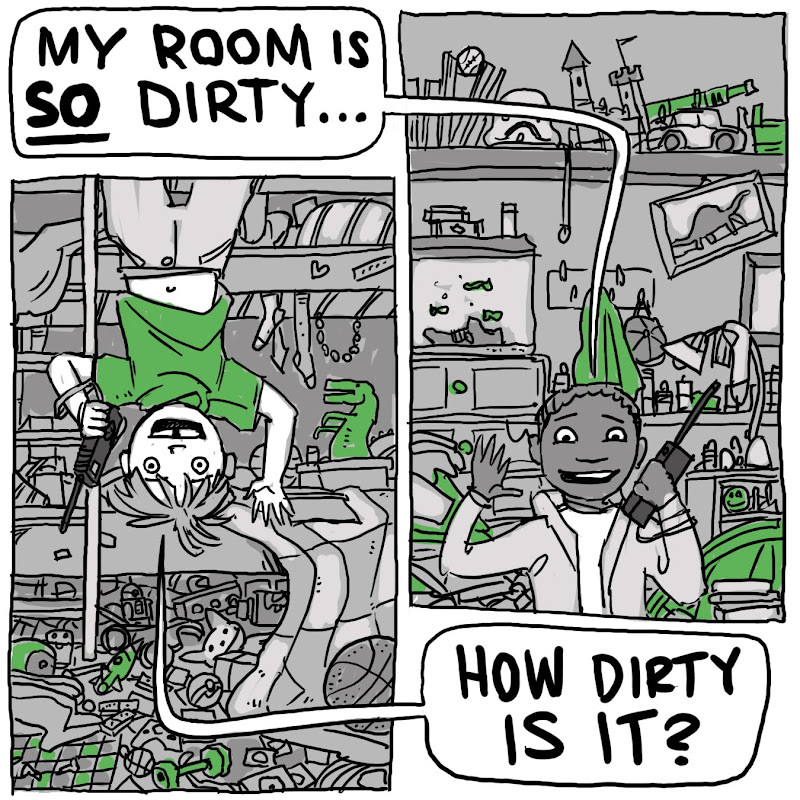 My room is SO dirty...How dirty is it? KID 2: How dirty is it? KID 1: My room is so dirty I have to wear a gas mask! KID 2: My room is so dirty the cockroaches have to wear gas masks! KID 1: My room is so dirty... actually, it's not any more. It's clean! KID 2: How clean is it? KID 1: It's so clean that I can go outside and play now! I'm feeling pretty good about the entries so far. Nothing terrible yet. If you are enjoying these, be sure to check out illustrator Julie Olson's blog, she's playing along too. I love this idea. It's one of those ideas I wish I thought up so I could draw it. My room's so dirty, all you can see is the top bunk. Nice! I love the use of jokes in this manuscript! Reminds me of my manuscript "Your Mommy," where two boys use variations of the classic "mamma" jokes to show how great the other's mother is. You know tons of parents would want to buy this. I'm always looking for books that my solve the issues of the day. It's SO fun for me (a committed NON-illustrator)to pop in to see your daily PBM creations. Thanks! Now I'm headed over to Jed and Julie's sites. Any others sites I should peruse? Brilliant! I sense a subtle message, but I'm not quite sure what it means... But I'm heading to clean the kitchen. Thanks everyone. This one could be fun. Really cartoon-y and over the top. crave-this was DEFINITELY inspired by the age-old, "Yo Momma's so fat..." routine. Jean-Jed and Julie are the only other illustrators I know who are doing the marathon so far, but I'll post to any other illustrator/marathoners who want to be linked. One of my favorite books as a kid was about a girl with a REALLY messy room. I loved it because of what the illustrations could show...a bunch of crap. Comic style, even better. Frames and frames of jokes and CRAP! And right now, that's how my office/studio feels. Thanks for the link, btw. I tried a new style today. Check it out and let me know what to push and pull with it.